The design of this script is dark and I have used black and yellow as the primary color and there's no admin panel for this one which is why it's cheap. Even without admin panel, you can still edit most it's details such as API keys, ads and all from the config.php file which won't be a tough job at all. YouTube as the main source. The requirements are very basic and should be available in most web hosting. Documentation can also be found inside. Upload and extract the file ccb4.zip to your root folder using file manager from your hosting. Open config.php file which will be in the directory where you've uploaded and extracted the ccb4.zip file. Your website URL or the domain name must start with 'http://' and end with slash '/'. Create new last fm and YouTube API keys and replace the default ones. Edit Your social media usernames by editing the below lines. Open the files [ad-468x60.php, ad-728x90.php and ad-300x250.php] and place your ad codes respectively. 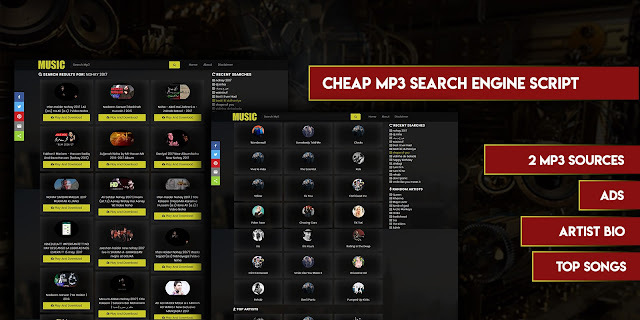 Free Download PHP MP3 Search Engine Script With URL Expiry by Codester. It supports multiple YouTube API keys and has a feature called URL expiry. It also comes with an admin panel.